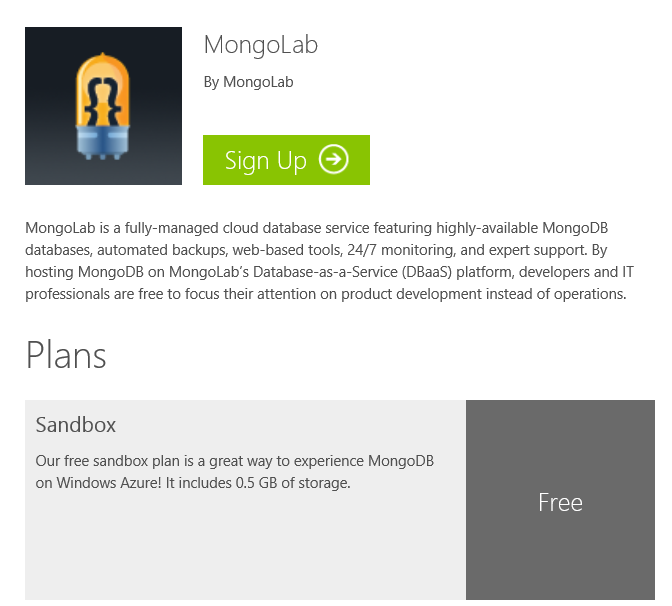 Azure Store – Free MongoDB, New Relic, SendGrid and more.. I set about to put together a new app and challenged myself to do the whole architecture on azure without spending a penny. The only caveat I set was that I should be able to scale if everything goes really well. I was amazed hat you can get so much for free, I can basically stand up a monitored, scalable architecture with no outlay and then look at scaling as needed – based on the success of my services. This is a great proposition for any entrepreneurial devs out there, grab the tooling and put your app together with no running costs while it gets off the ground!